globcon is a free, multi-platform software tool enabling full control of many DirectOut products via a single, standardised graphical interface. Virtual mode allows user to inspect the functionality of DirectOut products in detail. globcon (Global Control – pronounced “globe-con”) is a freeware application which allows greatly simplified and centralised configuration, control and monitoring of any combination of DirectOut devices. It is a multiplatform product, and versions for Windows, Mac or Linux operating systems may be downloaded from www.globcon.pro. globcon is a tool which allows access to any compatible DirectOut device, with a common user interface. It has been written with the full cooperation of DirectOut’s own designers, resulting in an elegant and well thought-out GUI which greatly simplifies how a suite of DirectOut devices may be set up and controlled. Screen layouts are coherent and consistent across the product range, while still accommodating user preferences of appearance. The application may be installed on a single computer on a network and can then be accessed from anywhere else on the network. Devices to be controlled may be controlled via Ethernet over the network connection or via USB, and are automatically detected by globcon and graphically presented on-screen. Screen layouts showing all connected devices may be user-defined: the default display shows signal level bargraph meters for each device and status indication. Clicking on any device opens a larger window with enhanced meters and access to all device functions. 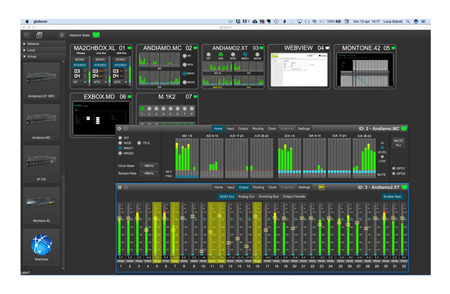 Control possibilities can exceed those available from the devices themselves in many cases: for example, the ANDIAMO range of interfaces permits level control of all inputs and outputs through a set of on-screen faders; additionally, any set of faders may be grouped together for rapid control of multiple channels. globcon allows configuration of devices to be performed off-line and then uploaded; similarly the current settings of a device may be downloaded to the software. Devices can be renamed and entire projects involving multiple devices may be stored, recalled and uploaded at will to simplify repetitive signal routing tasks. A library is maintained of the full range of DirectOut devices; a Virtual Mode allows the user to examine in detail the facilities available in devices that do not exist as part of the current system. It is intended that future updates to globcon will extend the range of control possibilities to other manufacturers, while maintaining a common GUI style and method of operation.